Amplitude is another word for loudness. Pitch is how high or low a sound is. Sound travels in invisible waves and while some waves are long and wide, others are short. Long sound waves create low-pitched noises like the distance of thunder rumbling. Closely spaced sound waves can mimic high-pitched noises like the screech of car brakes. The one intriguing factor here is when a piano, violin and saxophone are all playing the same note at the same loudness; they do not all sound the same. The sounds they produce have harmonics, which means that there are higher and quieter notes mixed in. That’s what gives instruments their unique sounds. During our lifetimes, we find ways to protect ourselves. Voice manipulation is one of those ways. For example, you ask someone how they are and they say “I’m fine” but there is a slight fall in pitch after a high sound at the end, which tells you the person may be fudging. When your mind creates tension in your body, it tightens your voice. Vocal sabotage. There are other factors about emotion. Previous examination has shown that listeners may be more likely to remember the emotion behind someone’s words than the words themselves. If that’s the case, can we change someone’s emotional experience by altering their own voice and throwing it back at them? DAVID (Da Amazing Voice Inflection Device) is a free, real-time voice transformation tool. It has the ability to change the emoting of any voice recording even if it wasn’t the intention of the speaker. Researchers from sound labs and universities around the world have had great fun with DAVID. This platform applies audio processing algorithms to change voice acoustics into various emotional sounds. Just by modifying the pitch and inflection of a voice, they can make it sound happier. More positive. The energetic range of the voice can also be changed spectrally—to be ethereal and lighter—in order to sound more confident and excited. We all know that when we listen to other people speaking, we can typically tell whether they are happy, sad, nervous or otherwise engaged and we do this just based on the sound of their voice. Scientists decided to manipulate a person’s tone while they were speaking themselves in order to gauge its effect. While the subjects of the DAVID test were speaking, the researchers changed the tone of their voice so that they heard the altered version through headphones. The scientists could make the voice sound happier or fearful and more. The findings demonstrated that while listening to their altered voices, the participants’ emotional states changed to match the new emotion. One of the more surprising elements uncovered was that the participants did not even realize their voices had been manipulated. Experts now believe that this suggests that people listen to their own voice in order to learn how they are feeling. So perhaps if you are looking to feel a little better, begin by sounding better. 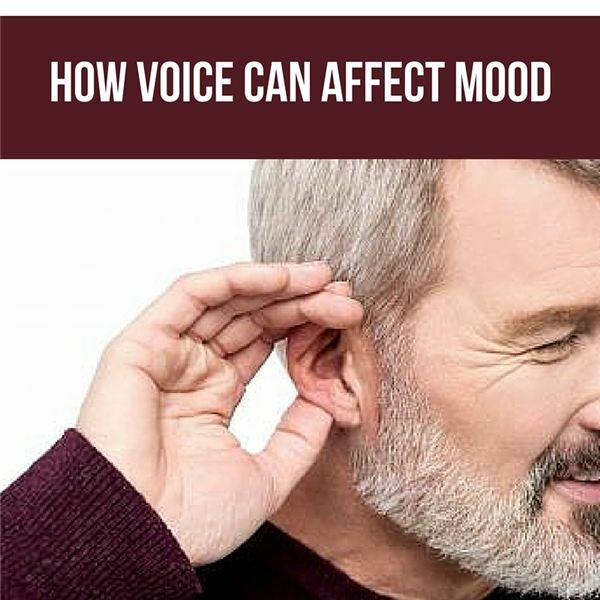 “The voice is one of our main channels of emotional expression, and the results of this study indicate that when we speak we do not just influence others but also ourselves,” says Dr. Petter Johansson, a researcher at Lund University in Sweden and one of the study’s authors. There are perhaps reasons why our voice creates an accurate picture of what is really going on inside us. Teenagers may sulk, often old men with medical conditions are grumpy and parents become angry—and these feelings not only leak out but also sometimes gush out! This may be nature’s way of helping us to adapt to a changing, chaotic world. Your spontaneous voice when spirits are high may allow you to take more risks, feel freer and are more likely than not to be rewarded. On the other hand, the downward sulking vocal inclination may just be you conserving energy and feeling guarded. In any event, experiments such as these do have great promise for therapy. They could be a way to treat mood conditions and to break through to people in order to induce a more positive attitude and perhaps recount painful memories in a controlled manner with therapists. Stewart, Melissa. How Does the Ear Hear? New York: Sterling Publishers, 2014. Book. Apps, Judy. Voice & Speaking Skills for Dummies. West Sussex, England: John Wiley & Sons, Ltd., 2012. Book. Image Source: FreeDigitalPhotos.net -What Did You Say? Treays, Rebecca. Understanding Your Senses. London: Usborne Publishing Ltd., 1997. Book. Bennett, Gloria. Breaking Through: From Rock to Opera, the Basic Technique of Voice. Milwaukee: Hal Leonard Corporation, 2001. Book.